As another hot month whizzes by its already time for another SRC post! This time around Nicole's The Daily Dish Recipes . Meet the super busy mother to five kids, who dabbles in DIY, home-improvement projects and photography part from blogging. Can imagine what a busy life she must lead, kudos! While I can barely manage my kids, barely been able to feed my blog the last couple of months, no prizes for guessing this really short post is being written at the last moment ( I procrastinate to a certain extent, but rarely this much!). Many yummilicious desserts, food and bakes on Nicole's blog, I chose to make these simple cupcakes (just a couple of days ago, almost last-minute again!) I have so begun to love brownies, but I had to stop myself from baking Dorie Greenspan's QuintupleChocolate Brownies and bake something else.. cupcakes? Yes, been seriously long since I baked some. 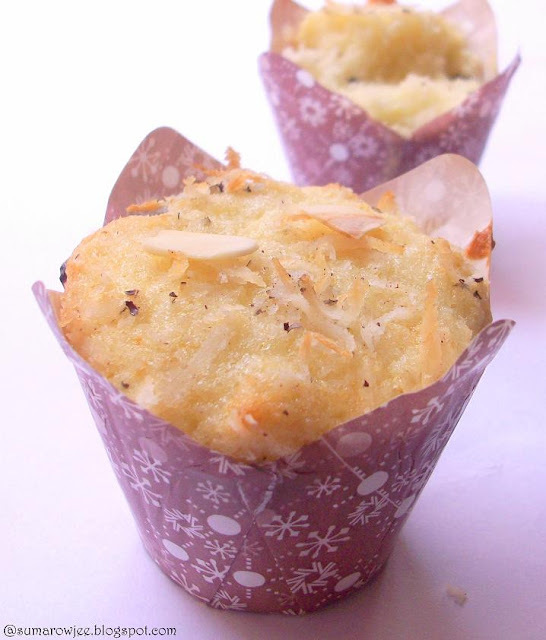 Coconut cupcakes, why not? Now that my baking goodies will arrive with sis-in-law who will be visiting soon, I can afford to spend some of the coconut extract! Reading through the recipe, it sounded faintly familiar. The Pistachio Hot Milk Sponge I had baked earlier! Cupcakes or muffins? While I am aware that these are two different things, am no baking geek and I really don't know what to call these! 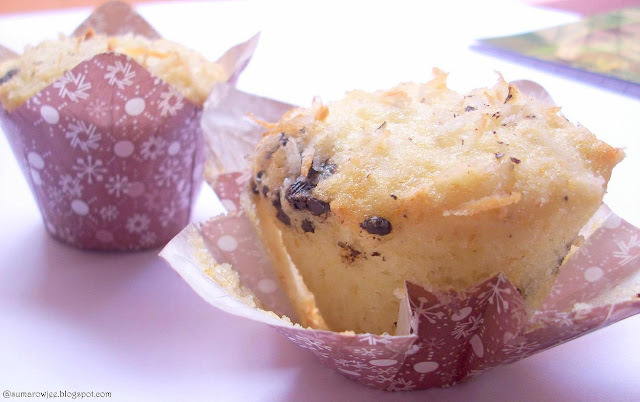 Cupcakes are supposed to be cakes in miniature and muffins are mini quick breads. These little things have very little fat but in the form of butter yet are light textured, quite soft and spongy ,almost like a cake, sans the richness factor (without the topping). Recipe from here. The recipe proportions on Nicole's blog will yield a substantial number of cupcakes (at least 32 at a guess) But since we are currently over-loaded with goodies from visiting grand parents and the frequent holiday eat-outs, I have made a tiny batch with a quarter of the recipe. I have also reduced the sugar and skipped the topping. Do double for more. 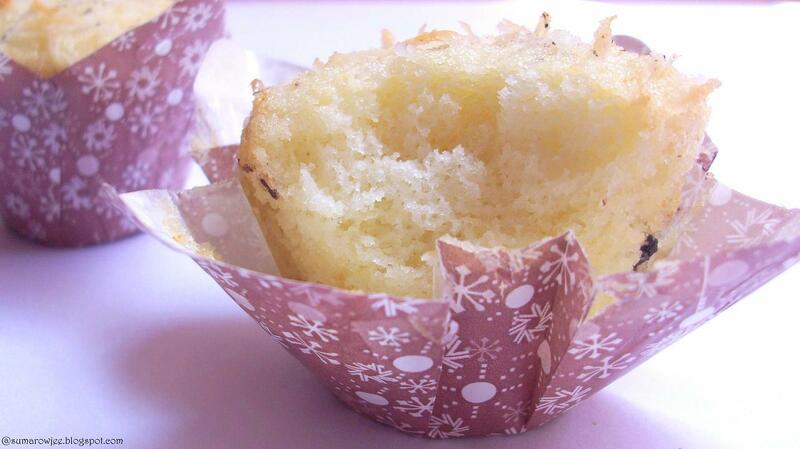 Procedure: Pre heat oven to 180 degrees C / 375 degrees F. Line a muffin tray with paper liners. Sieve the flour and baking powder twice, stir in the dessicated coconut. Keep aside. Heat the milk in a saucepan, add the butter to it. Cover to keep it hot. In a medium sized bowl, beat the egg till thick, about 2 minutes on medium high speed with a hand mixer. Add the sugar and beat for 5 minutes on medium high speed. Mix in the coconut extract. Fold in the flour mixture. Gently stir in the hot milk mixture into the batter. (In case, the milk is no longer hot, heat it again) Stir it into the batter gently. Fill the liners about 2/3 full. Bake for 15-18 minutes or till a wooden skewer inserted in the middle comes out clean. Do not over bake. The cupcakes will brown lightly around the edges and turn a light golden on top. Cool the cupcakes on a wire rack. Eat them as is or with a topping of flaked coconut, brown sugar, butter and cream as Nicole does. Please note : Dessicated coconut here is the very fine almost powdery kind of dried coconut. If you add more of it your batter will be firmer and probably the cakes dry. Use good quality coconut extract and in a small quantity or the smell can be quite over-powering and unpleasant. Try using crushed cardamom and omit the chocolate, then you may wish to add a tablespoon more of sugar. The procedure for preparing the batter is slightly different on Nicole's blog, I have made the cupcakes the same way as I have made pistachio hot milk sponge. Uncharacteristically scorching, unrelentingly hot, this is not the Bangalore I have known! The discomfort, the constant need to keep the fans whirring, guzzling gallons of buttermilk and water. Water as a drink, a sight and sound is so welcome! An invite for dinner at The Island could not have come at a better time. Why, the name itself sounds like fun, the pictures of the restaurant charming. 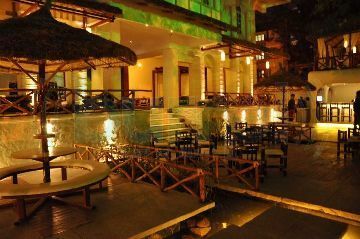 Well, few will not want to dine beside a cascade of water, the low tables set on raised platform, water gently flowing underneath, hammocks completing the picture. There is also an upper deck seating which gives you a view of the area below. 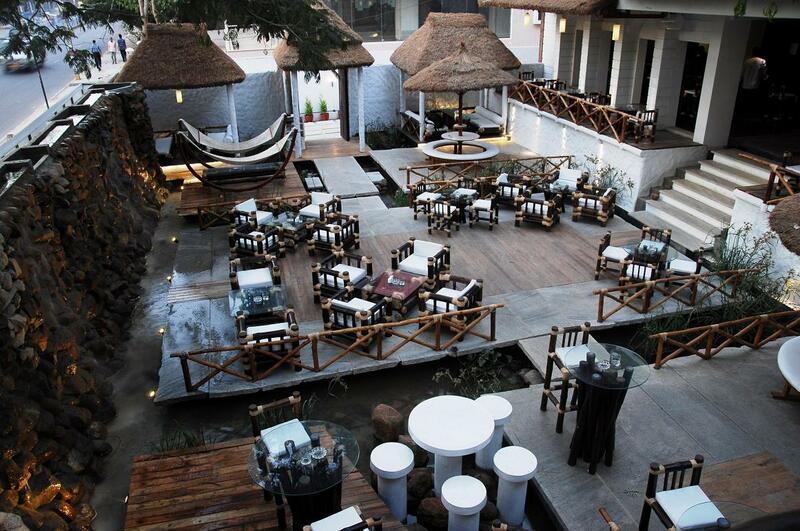 Casual dining in a very pleasant, relaxed ambiance , think a casual party in your garden. A place where you don't need to 'dress up' for a meal out. The concept here, as the owners Mr. Kay Mikado and Mr. Pankaj Bhatia emphasize, is a casual dining lounge, affordable good food in a very nice beachfront kind of ambiance. The cuisine - Mediterranean, Fusion and Continental. We were greeted by Priyanka of Avian Media and Mr.Vipul Khurana, the manager of The Island. Sweata, Aliena and Monika were yet to arrive. Once all of us assembled and settled down, the cool drinks were first of course. All of us opted for mocktails - The Bartender's special, Strawberry Pinacolada, Island Special and Fruit punch. They were pleasant enough, but a little too sweet to my taste. All of us could not help but notice a slightly predominant bubble-gummy flavor, almost over-powering the flavor of the fruit in the mocktails. The Spicy Cheesy Corn Soup with Celery and Parmesan, served with bread was extremely tasty, quite spicy and quite unlike the ubiquitous corn soup. Don't go by the seemingly small portion of the soup, its quite heavy and you can't have one serving all by yourself unless you intend the bread and soup to be your entire meal. Definitely worth trying! There is a Chef's Special vegetarian soup and a couple of more non-vegetarian soups. We tried the House Chef Salad - greens with marinated cheese, olive, asparagus, sun-dried tomatoes, capers, oregano and vinaigrette dressing. Substantial, with lots of crunchy greens, I would have loved more of sun-dried tomatoes, cheese and asparagus in the salad, but there seemed to be almost none in the portion served, at least on my plate. I found the dressing way too sharp for us, am not sure if the salad is intended to be that way, so check before you place an order for this. If you fancy tequila, Fuji Apple and Fig salad with smoked almonds, honey, lemon and tequila dressing may interest you. An assorted platter of appetizers was recommended by the staff as we could not decide on what to taste! The Beer-battered Onion Rings were crisp and perfect, so were the Spicy Rub Potato Wedges. The delicious Nachos (a huge serving at that) disappeared quickly, the gooey melted cheese on the crisp tortillas perfect, a very appealing contrast of textures and taste. Spicy, cheesy, gooey, crispy all at once! The Island Delight which was crispy fried vegetables in smoky BBQ sauce was truly good. The seasoned cottage cheese cubes, though very soft, tasted faintly of cardamom, but no other flavors came through, hence did not leave an impression. The Fried Cheese Balls were OK, or probably too cheesy for me. Moroccan Fried Mushroom, Bajan hummus, Per-Peri Grilled Baby Corn and Mushroom are a few more appetizers on the menu. Predictably, our stomachs were creaking under the weight of all the food we had eaten and there was hardly any (note, I only said hardly, and not absolutely ;) space left for the main course. If Priyanka and Michelle, the internal PR Manager, were shocked at our enthusiasm to taste most of the stuff sent to us, they were too polite to show it :). The Penne Alfredo with roasted vegetables was tasty, but a tad too dry, I love my creamy pasta with lots more sauce. The Thai Red Curry with steamed rice was appreciated by the others, but I am not much of a Thai food lover. We absolutely loved the vegetable sizzler with aromatic and very flavorful rice and it was a shame I ate it when I was full (meaning when I had space only for desserts) otherwise, I would have surely loved to eat more of this. Do try this if you visit. Now the most-looked-forward-to part of the meal - I must confess, while I am still ordering appetizers, I must have a quick peek into the deserts menu :) Dessert was sunken chocolate with a sweet coffee sauce. With a brownie like texture, barely sweet with a nutty, coffee flavor, it was a winner topped with the creamy coffee sauce. I don't know how the recipe works, but I would surely try recreating this at home - slightly sweet brownie, with a not-very-sweet sauce. Can't wait to try! There was a pineapple and coconut based dessert which was quite pleasing. There was another cheese-cake kind of textured dessert which was quite tasty as well. An enjoyable meal in great ambiance, good company and rounded off with good desserts! Mr.Kay Mikado also plans to introduce Sunday brunch for kids with food, fun, magic and other fun activities. The idea is to get kids have a good time and great food, while the parents get to enjoy a quiet meal perhaps? A place to visit again for sure, may be when its cooler. There is also a buffet priced at Rs.299 plus taxes from Monday to Saturday. 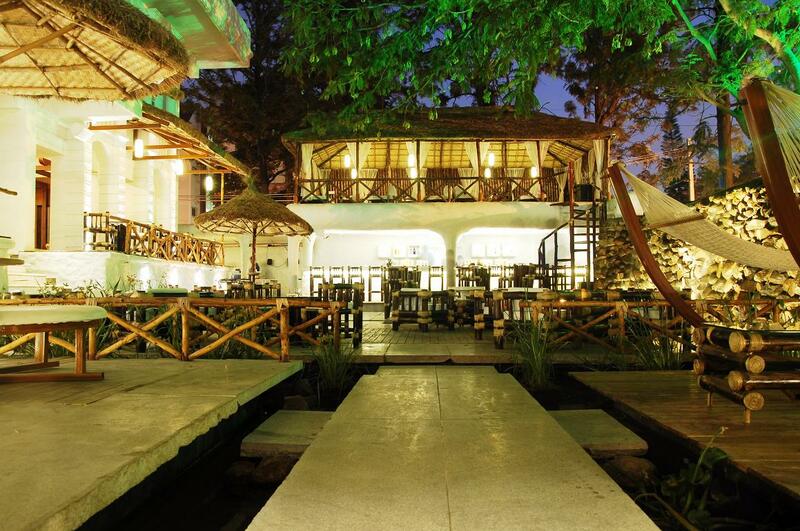 Go for a very pleasing ambiance and good food at affordable prices. The service was quite quick, valet parking available.The USP - the ambiance. Needs work - more desserts! The seating can be more comfortable. Meal for 2 - Approximately Rs. 1,200 plus taxes. 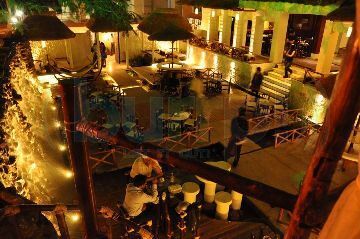 #3, 80ft Road, Indiranagar, Bangalore, India 560038. Apologies for not updating any food pictures here. I was not carrying a camera, the pictures above are courtesy Avain Media and Burrp. Do you love the taste of fresh home made bread, but wish you could have it warm on your table in much, much lesser time? Do you hate it when you knead, proof, wait to bake the bread and power supply plays spoil sport? 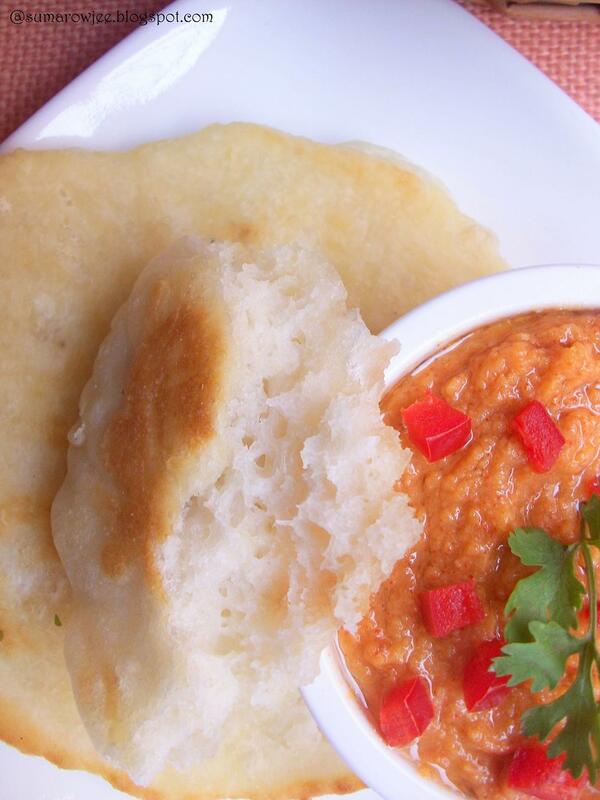 How would you like to have bread dough in the fridge which can be transformed into spongy bread in under 10 minutes? And you don't even need to turn your oven on? Yes, bake it in your skillet. Skillet bread!! Jeff Hertzberg and Zoe Francois call this as Naan bread. Who hasn't read about this famous duo, the physician and the pastry-chef, the co-authors of Artisan Breads In 5 Minutes A Day ? If you haven't yet, they have revolutionized the concept of baking bread at home. Most of their breads as far as I know, are no-knead breads. The dough is generally made by just mixing the ingredients, letting the dough proof at room temperature for a couple of hours. You could bake the bread right away or refrigerate the dough for up to 15 days, bake as and when needed to have freshly baked bread anytime you please! The concept of 5 minutes here is the hands on time you would be spending for preparing the dough and then later for shaping it. Perfect for busy folk, lazy folk, efficient folk (generally most humans) who like to bake their own breads. 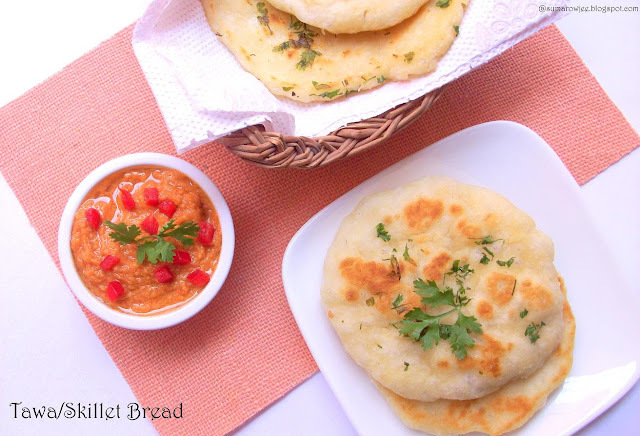 I was looking for a good recipe for naan and hit this post where Zoe mentions that she has baked naan from almost all bread doughs including the master boule dough. A no-knead yeast bread which can give you flexibility to choose your 'baking' time and can be baked in your skillet in a jiffy tempted me so much! 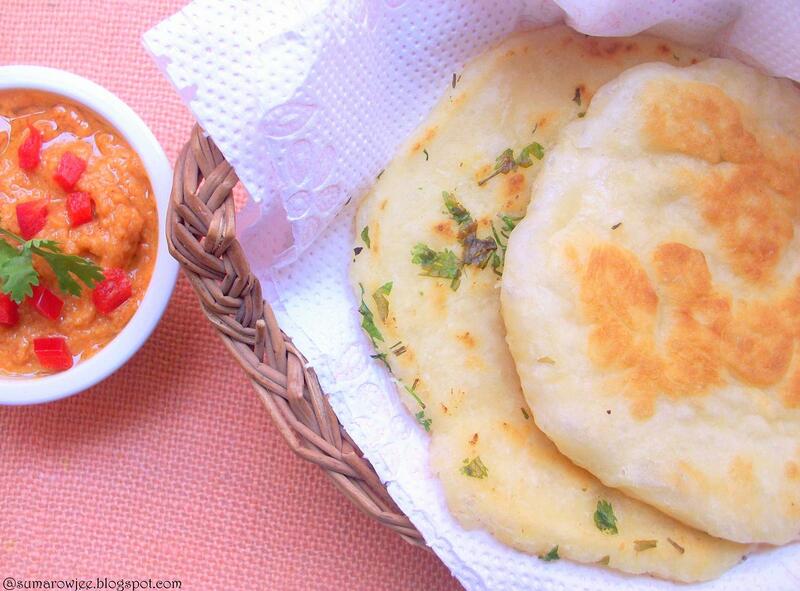 Agreed, it does not taste exactly like or have the texture of the naan we eat at restaurants, its more a cross between a yeast bread and naan, but indeed a very nice bread to bake. Tasty, easy and lending itself to so many possibilities, a recipe I am glad I came across! Eat it as is or stuff it with what your heart desires. Eat it warm from the skillet or a couple of hours later in your lunch box, it will still be soft and taste good! I must admit though, I liked the bread most on the day I mixed the dough. The bread, made after 24 hours of mixing the dough was great too, but slightly sour (if you ask me). But if you are a person who will enjoy it, by all means use it much later. I have made a quarter of the original recipe (all the 3 times I made it) as I was initially not sure how we would like it and then of course, I do not want a whole lot of dough which I can't use up in one day. The small changes I have made in the recipe is a slight reduction of salt, addition of a tablespoon of oil to replace part of the liquid, but then eventually I had to add a tablespoon of water to get the dough to the right consistency. Here is what we do. Recipe from here for the master boule dough. Procedure : Mise en place. Sift the flour and salt. Keep aside. In a large bowl (which can allow you to mix the dough well without working the dough too much) take the lukewarm water. Add the yeast, mix it in. Add the oil, tip in the flour. Mix just enough (with your hand) to incorporate the ingredients together into a homogenous mass, may take about 30 seconds to do this. Do not knead. The dough will be sticky. As mentioned above, start with 3/4 cup minus 1 tablespoon water, add the extra tablespoon only if you need to add. Transfer the dough to a (transparent) container with a lid, cover the lid loosely. Mark the level of dough with colored tape. Allow the dough to rest at room temperature for about 2-3 hours. The dough is supposed to rise and then collapse during this period. My dough almost tripled and then showed little signs of collapsing at the end of 3 hours. I did not want to leave it out for much longer so I have refrigerated at this point. Cover the lid such that gases can escape from the container. Please note: The rise and collapse time is only indicative and will vary according to the atmospheric heat. It may take longer when the weather is cooler. You could bake the bread after it starts to collapse, but the dough will be too sticky and may be difficult to handle. Refrigeration for 3-4 hours will help handle the dough easily as it will firm up. After refrigeration the dough will feel slightly rubbery and firm. When you wish to make the bread, take out as much dough as needed, make small orange sized balls out of the dough, bigger ones if you wish the bread to be thicker or larger. Heat a teaspoon or more of oil (or ghee if you wish) in the skillet. Butter has a lower burning point, hence not recommended. ( I like to use my shallow non-stick pan which I use for regular cooking and not my dosa-tawa, the shallow shape allows better cooking I think) . Flour your work area generously. You could also rest the dough for about 5 minutes before rolling. Take a ball of dough, lightly roll it into a circle ( I made mine about 4-5 mm thick at a guess), lift it carefully and lay it into the skillet. Cover the pan with a lid. This is to 'bake' the bread. I cooked on medium heat for about a minute, you will see bubbles in the bread. Lift with a pair of tongs to see if the bottom is cooked and golden brown. Flip and cook covered on the other side for another minute. The cooking time varies depending on the thickness of the rolled dough and the heat. If using more fat, I guess, a longer cooking time will not allow the bread to burn nor make the outer part chewy. Make one or two, taste and then decide how you want to go from there. Serve warm from the skillet or keep covered in a container to serve later. Eat as is, or with hummus or curry or just a dollop of butter. 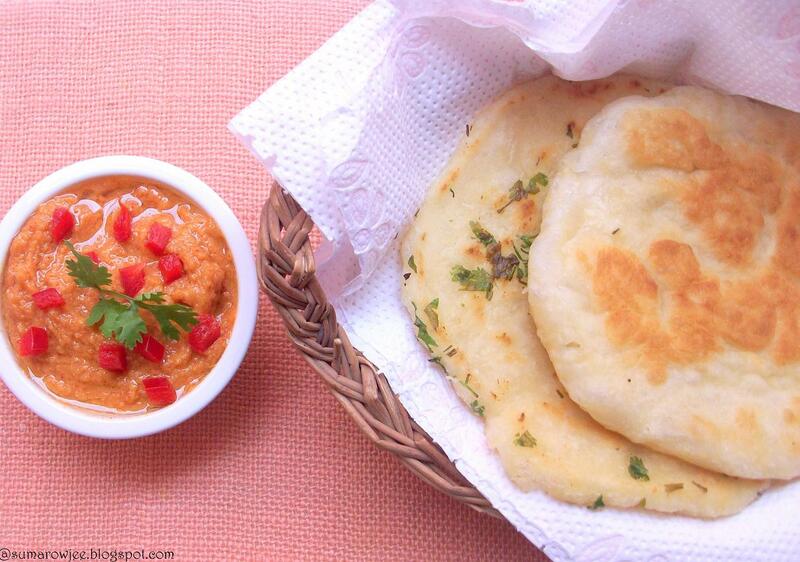 You could also stuff the dough (like parathas) with chopped sauteed onion and or cottage cheese and spices. Good lunch box idea I think.. I see myself making this again, try more variations, with half whole wheat perhaps? A sweet dough next to try sweet variations. Delicious thought! Please note : The authors measure flour using the dip and sweep method which is 140 grams for a cup of APF as mentioned on their site. There are hardly any ingredients to make this simple and easy bread, but good quality yeast is critical to the success, so is the temperature of the water. If the water is too hot, you will kill the yeast. Good quality yeast if very old or stored improperly will not give you the desired results. The bread is Yeast Spotted. Life is more chaotic than ever during the summer break , obviously not a time I look forward to. I am certainly not one of those mothers who wait for school holidays so that the they can get a break from the usual rush which is part of school days. I envy mothers whose kids actually help take care of the younger ones and run little errands for them as well. In fact, I have a friend whose older daughter takes care of her younger one as she does her home-work - while my friend takes a siesta! Of course I keep telling her that her children are abnormal ;) Normal are kids like mine who barely keep from tearing at each others' hair and don't even think about doing H.W unless I threaten an hour in the bathroom - no (story) books. During the holidays, I spend most of my energy for mundane cooking, work , resolving conflicts between the kids, occasionally taking them out for small outings in the evening and feeling guilty about not giving them more time and attention. I tip my toque to mothers who efficiently manage all of these. You will find me constantly looking heavenward (praying for patience and sanity mostly, other things will be a bonus!) and feeling bad for myself for not being regular with posts on the blog (now, that is a minor tragedy for a blogger!). For the umpteenth time in the day I sigh and tell myself, I am not cut out to be the best mother around. Reality then knocks on the door loudly and priorities shift - thankfully only temporarily. I love eating at homes of folk of a different culture as you invariably get to eat something new, relish it thoroughly and ask for the recipe. I have eaten this ajwain flecked deep-fried crispy snack called Nimki at a friend's place and had a sudden urge to convert this recipe into Nimki. Crispy, light and tasty, the results were not bad at all! 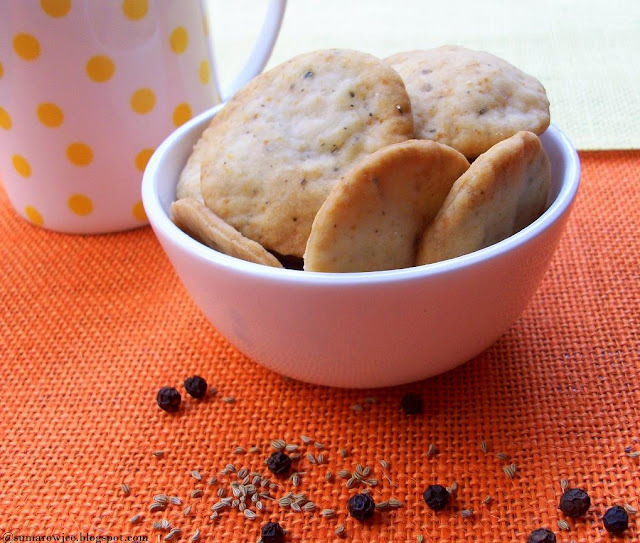 If you have not heard of nimki, its basically made out of flour, spices like kalonji, pepper, ajwain, some fat goes into the dough and then the cookies are deep-fried. But, let me warn you, these baked nimkis will not taste exactly the same as the deep-fried ones, but are definitely good. 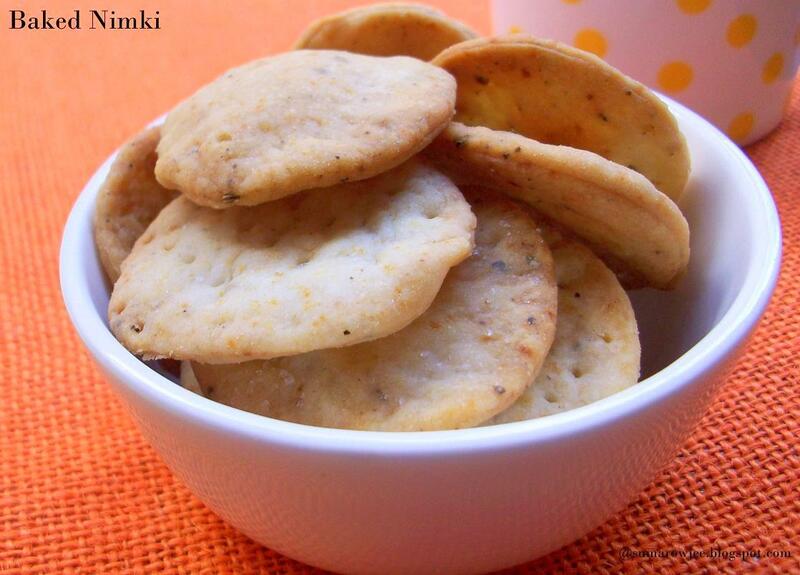 A lighter version of nimki , sans a whole lot more fat. You could play around with the spices here and create a different version - but then don't forget to share your recipe variation with me! Procedure: Pre-heat oven to 230 degrees C / 450 degrees F. Lightly grease and line your baking trays or sheets with parchment. Set aside. Mise en place. Sieve the flour, baking powder, salt and crushed crushed pepper into a large bowl. Mix in the ajwain. Make a well in the center, add the oil and water. Mix gently to bring the dough together to form a rough ball. You may at first think that you have added too much liquid but it will just make a very soft, slightly oily dough. Knead it very gently 4-5 times NOT minutes. Divide the dough into 2-3 portions. Flour the work surface very lightly. Take one portion of the dough, keep the other portions covered to prevent from drying out. Gently, roll out each portion into a circle about 2mm thick. (I will roll it into a square next time as it will give me even pieces without any scarps) Lift the rolled dough gently and lightly flour the counter and the rolling pin as needed. Dip a sharp round cookie cutter into some flour and cut out small rounds. You could also use a pizza cutter to cut into diamond shapes or squares. Transfer the cut pieces to the baking tray(s). I pricked some with a fork and some without. Bake for 11-12 minutes or till very lightly golden around the edges and very light golden on top. Do not over-bake or let them brown a lot. Watch very carefully after 10 minutes as you would be baking these at a high temperature. Bake a test batch of 2-3 cookies to see how long it takes in your oven. Once baked and still hot, very lightly brush the cookies with ghee . Allow the cookies to cool completely and store in an air-tight container. Enjoy with your evening tea! 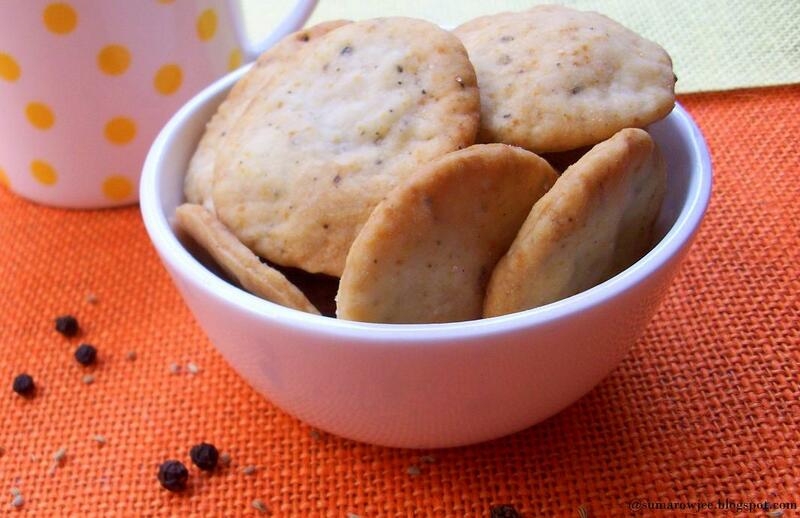 Please note : Avoid adding more spices later after mixing the dough as over-mixing may result in less light cookies. You could use the left over scraps to re-roll and bake cookies, but they will not be as light, but still tasty. Essential Basic Baking Tools & And How To Use Them . Home-baking in India not being all that common, until very recently most of us associated it with bakeries or commercially packaged bakes. Few of us have seen our mothers baking, thankfully blogs and the internet provide more than enough inputs for us in this area. Stores which sell a plethora of baking stuff online can confuse a new baker as to what's really essential and useful and what is nice to have but not essential. 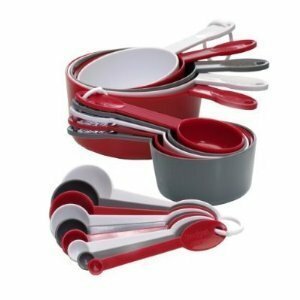 If you have just stepped into the amazing world of baking and specially if you live in India, this post may be of help. Most of the images below are the from the WWW. UPDATED! Watch my videos on baking gadgets. You can also subscribe to my channel on YouTube. Click to subscribe now! First and the most important, a good oven. You could use a box-type oven toaster griller (OTG) or a convection microwave for home-baking. Microwaves come in basic models which can be used only for cooking and heating, models with a microwave and grill mode only (no convection) and models with grill, convection and microwave modes. The last one mentioned is the one you will need for baking. I use a small Morphy Richards OTG and a LG convection (30 liters) microwave both, I find them very good quality wise. If you have the space, go in for an oven with at least 30 liters capacity. I plan to get myself a 45 liter OTG soon. If buying a microwave for baking needs, do check the setting of the temperature in the convection mode as some microwaves set with a difference of 20 degrees, example 160, 180, 200, 220 and so on. Mine sets with a difference of 10 degrees as in 180, 190, 200 which I think is much better. I would prefer the setting to be digital rather than analog for more precision. I find the baking more or less the same in both the gadgets, but one distinct advantage of the microwave is the quick-pre-heat in under 5 minutes as compared to the 20 minutes in an OTG. Of course, you would also need to consider the after-sales services while choosing a brand. Nice to have : A built in gas oven, have never used it though!! To start with, good quality heavy duty aluminum pans - 8'' and 9'' square and 8'' and 9'' round tins should suffice. These can be used for baking brownies, cakes and cookies. Spring-form tins, i.e, tins, with removable bottom and sides which come with a metal clasp are useful for baking sponge cakes and other delicate cakes, setting cheesecakes, baking tortes etc. Bundt pans help in baking cakes in a decorative shape, but we do not get a great variety here. 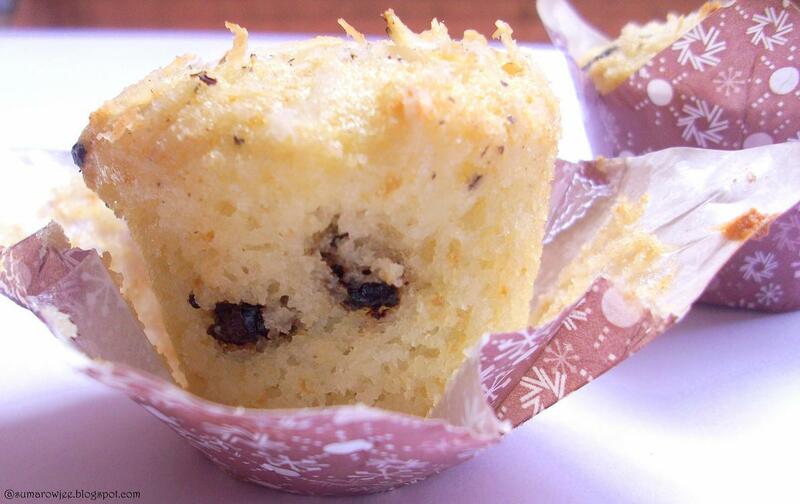 Get muffin trays which fit in your oven. Muffin liners too. You can get these at IBCA, GA, Adams, Jamals apart from most departmental stores. Do measure the tins before you buy! 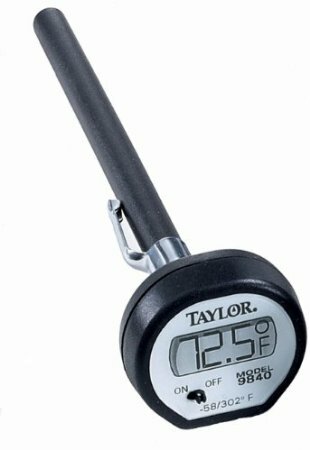 If you buy dark colored ones, you will need to bake at a temperature 10 degrees C lower than what's given in the recipe. Nice to have : Mini bundt cake tray, mini muffin pan, mini tart pan, donut pan. 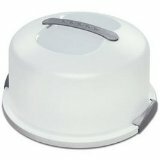 A tube pan is a pan with a removable bottom and a tube in the center) is a must for baking chiffon cakes and angel food cakes. Do not buy a non-stick tube pan as chiffon cakes are inverted and cooled and the cake needs to stick to the pan as it cools. But again, these are not available here, so import! Loaf tins: A 9'' x 5'' X 3'' pan and a 8'' x 4'' X 2 1/2'' pan are useful for baking yeast breads and quick breads, tea loaves and pound cakes. Nice to have : Mini loaf pans, Pullman loaf pan, Dutch oven. Pizza pans, cookie sheets and sheet pans: You could use your cake tins or the round tin which comes with your microwave for baking pizza. Ditto for baking cookies. You could also use cookie sheets provided you get them in the size suited to your oven. Nice, but not really necessary. Sheet pans for baking Swiss rolls. And yes, you can use aluminum pans both in the OTG and in the convection mode of microwave for baking. 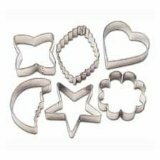 Cookie cutters : In my opinion, metal ones are better than plastic as they cut better, with the firm sharp edges. Pie tins : A 10 '' pie tin (with a removable bottom) and a 12'' one if you can find it. You could also use mini pie pans. Ramekins : These pretty decorative, bake and serve things come in a range of colors and sometimes with lids too. Go for 1/2 cup (120 ml) capacity ones and smaller ones too if you wish. Perfect for baking choco-lava cakes and baked custards.Check at Westside, Lifestyle, Adams and Arihanth Plaza near Commercial Street. Baking parchment : This is useful to line your cake tins for a really easy and neat release of your bakes. This is not the same as wax paper or butter paper we get in most shops, please do not use it as the wax melts sometimes transferring it on to your cake, which is not desirable. 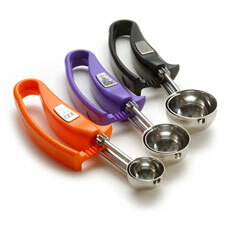 You can get this at IBCA and GA.
Standard measuring cups and spoons : These set of cups and spoons are meant for baking. The volume of 1 cup is 240 ml. The cups come in 1 cup, 1/2 cup, 1/3 cup and 1/4 cup measures. Spoons come in 1 tablespoon, 1/2 tablespoon, 1 teaspoon and 1/2 teaspoon measures. We do not get a set with 1/4 teaspoon measure, though I wish we could. 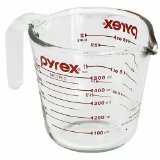 Liquid measuring cup: Used for measuring liquids. Weighing scales: Accurate measurements being very important for baking, this is a great tool to invest in. I prefer weighing ingredients to measuring them with cups or spoons - for greater accuracy and speed too. Again a digital one is really helpful and good, avoid analog scales. I use scales of a brand called Belita. Stores to check : GA, IBCA, Adams, Jamals. Some online stores in India too sell these, though I have not purchased. Spatulas: Good silicon spatulas are very helpful for folding in flour into the batter, scraping every bit of batter from the mixing bowl. Be sure you do not buy rubber spatulas as it gives off that awful rubbery smell and somehow, not a very comfortable thought for me to use one for cooking and baking. Most of the stores here sell rubber spatulas. The silicon part works great when its not too stiff neither too soft and too flexible. Whisk: A wire whisk (often called as an egg beater here) is very helpful for whisking liquids, eggs and sometimes for simple recipes which do not need a lot of beating of eggs etc. Even if you have a hand mixer, this is something you must have. Again we also get the spiral kind of egg beaters which I do not prefer to use. 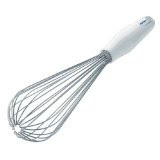 A very large balloon whisk (imagine a giant version of the above whisk) is supposed to be great for folding in flour in chiffon cakes and other foam cakes where its important to mix flour without losing volume of whipped eggs. Nope, we don't get this here either! Hand Mixer : Not to be confused with an immersion blender, a good hand mixer makes whipping eggs, egg whites and cream a breeze. You can't achieve the same volume of eggs, whites or cream with a wire whisk or immersion blender. My Morphy Richards 300 watt hand mixer is indispensable to me. Some brands like Black & Decker come with a bowl and a stand for hands free operation. Its more expensive, but definitely worth checking out! 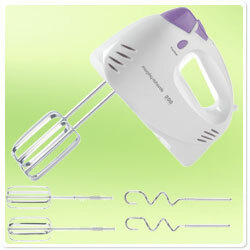 Stand alone mixer - This is the cool tool we see on Master Chef and Nigella Lawson's show. Even better whipping, more volume to eggs and yes, better bakes too! Also used for kneading bread dough. Expensive, heavy and space occupying (yeah, the classic case of sour grapes!) this is suitable for baking in large quantities, parties, entertaining or even the kids' birthday or class party. One gadget I hope to own one someday! Cooling rack: A metal rack with meshy open spaces to deposit your hot cake or bread tin on, cool your cookies and other bakes. Air circulation from the underside helps in even cooling of all the layers of the bakes. Your grill rack can be your make-do cooling rack if you don't have one. Instant read thermometer: My indispensable tool for baking breads. The temperature of the bread (irrespective of the color) is an indication of whether its fully baked. Make a loaf as rolls or vice -versa, and hey how about a chocolate bread? Bench scraper : To scrape sticky bread, pizza or puff pastry dough from the kitchen counter. A giant version is supposed to be best for lifting rolled puff pastry dough and the kind. Cake tester : You could use a toothpick of course to test the done-ness, but taller cakes (say a chiffon cake or 10 cup bundt) and your small tooth-pick may decide to get greedy and disappear into the cake! Use thin wooden skewers (meant for grilling purposes). Even better, a thin metal one, someone coming down from the US? I got these wooden ones from Adams, Shivajinagar, but do check out other stores too, ask for wooden grilling sticks. Slotted skimmer : The kind of thing used for deep-frying, but a largish one. For folding in flour in a lot of whipped egg with minimum air loss. I loved the result when I baked this chiffon cake! Zester : For zesting oranges, lemon or lime, finely grated chocolate. I use a Microplane zester, great zest in seconds with minimal effort. Again, am not sure if we get this here. Check at Shoppers Stop, Home Stop, Lifestyle. Serrated knife: Useful for slicing bread, cutting layers of cakes. Get a good quality, long one. Cookie scoops : Similar to an ice-cream scoop, this helps scoop out cookie batter / muffin batter evenly for even sized cookies / muffins without getting your hands messy. Available in different sizes. Pastry cutter / blender : Helpful to mix pie / cookie dough kinds where chilled butter needs to be cut into the flour. Silpat : Something you can roll cookie dough on, cut on the same thing, put in the oven too! 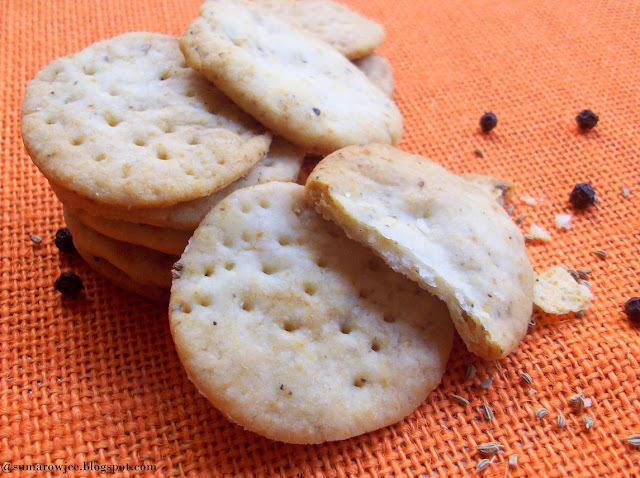 Very thin crackers , cut out cookies will be much easier. Again buy according to the size of your oven..
Cake Carrier : Refrigerate your decorated cake neatly or carry the finished cake to a party intact. Get ones with high domes and tight clasps. Silicon Brushes : These are easy to wash and clean, dry easily and do not clump. No unappealing bristles on your bakes as in the regular brushes. Use them for egg washing your bakes, brushing cakes with simple syrup, brushing breads with melted butter. Blow torch : The cool tool helpful for making creme brulee and other things. For beginners : The above mentioned are a few tools and gadgets, some you will need when you get started and some later on as you bake. To get started, the below will suffice. Mixing bowls - Any in your kitchen will work! A visit to a baking supplies store or an online one makes me feel like a kid in a toy store! The variety of tools and gadgets is mind boggling. The little list above is enough for now. Build on this as you go, the others I have mentioned are just for you to know and dream about - you will be using them soon! Did someone say I am being irregular with posts here? Did this read like I am over-doing the making up for delayed posts? Pardon me!! Lots more videos,baking tips and simple recipes for beginners on my Channel, Cakes And More, please do watch them and leave your comments for me!